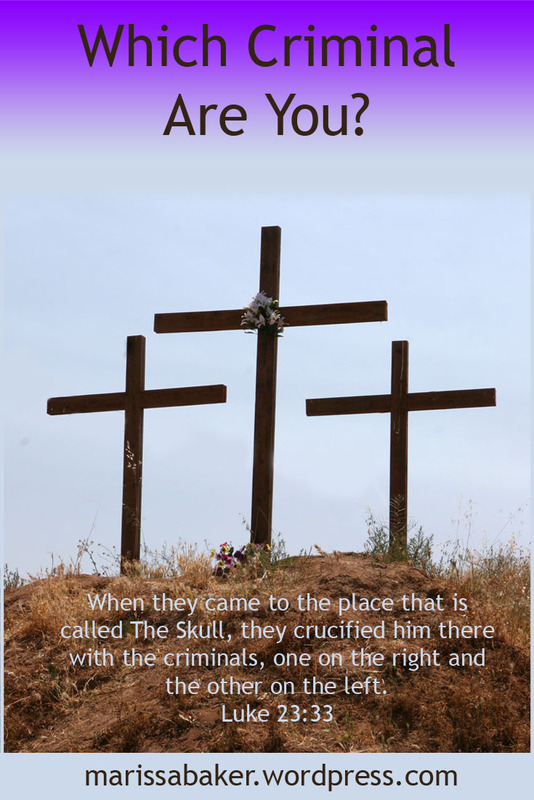 When Jesus died, He hung on the cross between two criminals. In Greek, the word is kakourgos, a compound of evil+doer. This refers to someone who’s employment is practicing wrong things. While we might not have personally broken laws that would make us criminals in our societies, we have more in common with at least one of these two men than you might think. Every human being has “sinned and come short of the glory of God” (Rom. 3:23, KJV). Because “sin is the transgression of the law,” this also makes us all law breakers (1 John 3:4, KJV). Like these criminals, we have practiced things that were not right. And when we recognize that fact, we also realize that “the compensation due sin is death, but the gift of God is eternal life in Christ Jesus our Lord” (Rom. 6:23, LEB). Like the criminals, we’re facing death and Jesus is there. But how do we respond to Him? 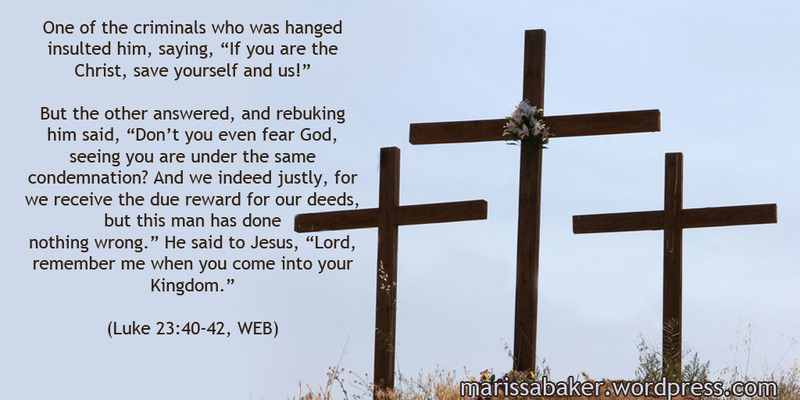 In contrast, the other criminal was “softened at the last.” He acknowledges the justice of their punishment as “the due reward for our deeds” (Luke 32:41, WEB). He’s much more humble, willing to accept the consequences of his actions and admit their wrongness. This basic attitude difference sets the stage for other differences between these two men. “If you are the Christ, save yourself and us!” The first criminal made two major mistakes in this statement. 1) He doubts Jesus is the Christ. 2) He demands salvation. People are saved after they believe and repent, but this criminal wanted things in a different order. He challenged Jesus to prove He was in fact the Christ by providing physical salvation. He didn’t even say he’d believe in Him after that; he just wanted the benefits of knowing Jesus without the commitment. We can’t do anything to make God give us salvation; it is a free gift. And the other thief’s faithful prayer to Christ reflects an understanding of that fact. First, he rebuked the first thief for his pride, arrogance, and unkindness. Then he looked to Jesus and said, “Lord, remember me when you come into your Kingdom” (Luke 23:42, WEB). He didn’t demand anything. He knew Christ had the power to do good things in his live and he simply asked to be remembered in whatever way seemed best to Jesus. We have no record of Jesus speaking to or acknowledging the first thief. This fits in with Paul’s observation in a letter to Timothy: “If we deny him, he also will deny us” (2 Tim. 2:12, WEB). You can’t push Christ away and expect Him to still give you salvation. The second thief benefits from Paul’s other comment: “For if we died with him, we will also live with him” (2 Tim. 2:11, WEB). For most of us, this is figurative — a dying to self and walking in newness of life (see Rom. 6:5-11 and Gal. 2:20). For him, it was also literal. Because of this man’s humility, acknowledgement of his sins, and faithful prayer to Christ, Jesus promised him new life. And we can also be with Christ in paradise after the resurrection if we follow this man’s example rather than that of the other thief. So let’s be willing to acknowledge our wrong doings, come before Jesus in humility, and ask in faith for His salvation. He won’t disappoint us.